SLP Concerts and GameLoud- the duo that consistently brings music fans widely-popular festival events such as the Bamboozle, Skate And Surf Festival, and Food Truck & Rock Carnival - recently announced initial details regarding the inaugural ROCK'N DERBY, taking place May 20-22, 2016 at the 35+ acre Schaghticoke Fairgrounds in Schaghticoke, NY (69 Stillwater Bridge Rd., 12154), just minutes outside of Albany, NY and positioned within driving distance from New York City, Boston, Philadelphia, Montreal, and more. This isn't just a festival, this is a three-day, 24 hour camping, demolition derby concert experience! Today, ROCK'N DERBY is pleased to announce the addition of several more of the greatest names in hard rock and heavy metal to the performance line-up, in addition to news about the main event - demolition derby cars and massive winner prizes! The electrifying ROCK'N DERBY Demolition Derbies have upped the ante with HUGE cash prizes since the original event announcement. So, what does that mean to you? ROCK'N DERBY doesn't just vow to bring back the fun of classic derbies in full force - they want YOU join in the entertainment! That's right - as an attendee, you can sign up to compete in real demolition derbies against your friends or even performing bands. Together, fans (first-timers or die hard hobbyists) and bands can join the fun and compete against one another. Competing derby vehicles will include everything from cars to short buses! Teams/interested parties can register to enter their car at $40 per entry until April 1st (on April 1st, the price goes up to $50 and closes May 13th) and paint and supplies will be provided to each team and derby fans to decorate their car on Friday night for the opening ceremony. Registration, fees and rules will be posted on Tuesday, February 9th at www.rocknderby.com. See below for prizing information. 7:00PM - 10:00PM - Demo Theme! Participants will be challenged to decorate or theme their demo vehicles! A $250.00 prize will be awarded to the best team. Paint and supplies to be provided by ROCK'N DERBY. 5:30PM - 9:00PM - Demolition Derby! 5:00PM - 8:00PM - Demolition Derby! Register and win big at ROCK'N DERBY! In addition, as of today, even more top performing artists have been announced for the inaugural ROCK'N DERBY, including A Day To Remember, Coheed And Cambria, Collective Soul, Extreme, Parkway Drive, All That Remains, Like A Storm, Red Sun Rising and TOOL tribute band SCHISM and '70's dirt rock cover band CHEVY METAL. 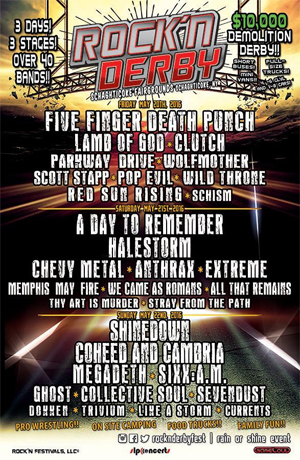 These artists will join the previously announced line-up of Five Finger Death Punch, Shinedown, Halestorm, Megadeth, Sixx: A.M., Lamb Of God, Clutch, Anthrax, Ghost, Wolfmother, Sevendust, Dokken, Trivium, Memphis May Fire, We Came As Romans, Scott Stapp, Stray From The Path, Pop Evil, Thy Art Is Murder, Wild Throne and Currents. Non-stop music begins upon the opening of gates each day - multiple stages, including the Upstate Concert Hall Arena, will host the artists above, with more to be announced soon. Plus, Pre/After Parties will include tributes to your favorite acts and some very unique surprises daily. ACTION PACKED GAMECHANGERWRESTLING<>P No GameLoud event is complete without GameChangerWrestling, featuring some of the most insane, intense, high flying and mud ridden wrestling matches all weekend long. With Battle Royales, Tag Team, and State Pro Championship matches, expect to witness history in the making. Wrestling matches will be featured all weekend in the Wrestlin' Shack. Make sure to stop by and catch the action daily. ROCK'N DERBY 2016 will feature areas to camp out with tents, in cars or in special pre-designated packages for camping options- making this a non-stop multi-day experience. Inside the camping area, guests will have access to electricity, showers, and running water will also be available in designated areas. Campers will have daily access to the festival site and demolition derby. Camper space will be on a first come, first serve basis, and RV parking and connections will be available, as well. Hungry? Like its sister event Food Truck & Rock Carnival, ROCK'N DERBY will include 20+ scattered food trucks and other mobile culinary vendors. In addition, several staple Schaghticoke Fair eateries will offer a wide variety of delicious eats for attendees to enjoy. Rest assured, ROCK'N DERBY will stuff everyone's bellies and 24 hour food options will be available. In addition, ROCK'N DERBY will offer a Village Of Barns & Brews, which will include multiple bar locations for fans to enjoy some of the finest micro and macro brews the region has to offer. Specialty barns will host a movie theater, a bar, VIP activities, a laser light show, and various sponsor activations. Unsigned bands are welcome to enter "The Crusade", a special battle of the bands style competition where bands can vie to perform at ROCK'N DERBY alongside musical legends! Sponsored by GameLoud, JRV Films, and Band Bodega, prizes include $250 and a main stage slot for the first prize winner, $100 and a side stage slot for the second prize winner, and four other slots are available to other winners. A video recap of the winners' performances will be provided by JRV Films and artist merchandise packages will also be provided courtesy of Band Bodega. All battle competition performances will take place at Upstate Concert Hall, 1208 Route 146 in Clifton Park, NY. Enter now and get more info at http://thecrusade.rocknderby.com/. This is a rain or shine event! Tickets are on sale now at Ticketmaster. See below for a breakdown of individual ticketing, camping, and VIP options and prices (see official website for campground rules, maps, and safety tips). 6 PERSON RV (20x40) - SOLD OUT! LIMITED TIME PRICING AVAILABLE NOW! Enjoy three days of non-stop demolition derbies, stages of live music performances, barns full of beer, wrestling, parties and so much more, only at ROCK'N DERBY 2016! Get your tickets at Ticketmaster.